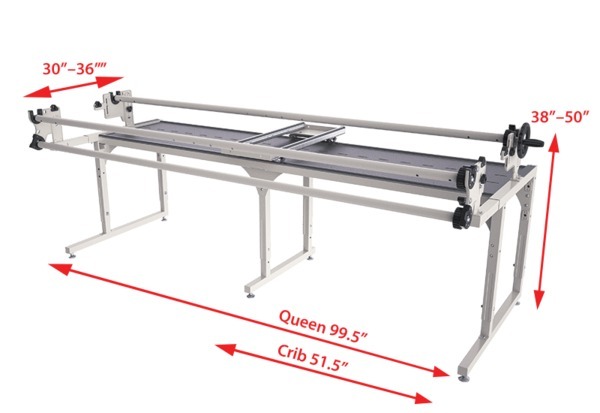 Continuum is the 1st machine quilting frame with adjustable depth front to back between rails. Adjust the fabric area by moving the front rail back depending on arm space. Grace Speed Control is also included IF your brand and model home sewing machine are included in the compatibility chart for these simple remote controls. Grace and Brother longarm quilting machines already have stitch regulation and speed control built in, so they do not need to be added. Grace Battery Powered Laser Stylus is also included if not already included in your brand and model machine. For over 30 years, the Grace Company has produced some of the finest machine-quilting frames available. Now the Continuum combines some of the most sought after features into a modular system that’s available for quilters of every level and nearly every sewing machine type. With steel and cast-alloy components, the frame is one of the sturdiest and longest-lasting frames ever designed. This modular frame has many available configurations and accessories. This is a no-baste frame designed to make your quilting projects easier, more convenient, and more beautiful. The frame is available in standard 8 foot or 10 foot sizes. Note: The Grace Continuum Frame is made for Qnique 14+ 15R and Q21 machines. 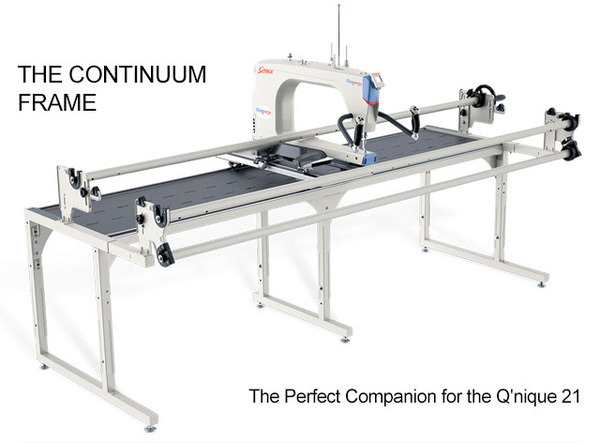 Continuum is not made for any other brand of longarm quilting machines which come with their own custom carriages. These carriages will not fit and not work on Grace frames. The Continuum Frame can be configured in multiple set-ups and optional accessories, so it will be the perfect fit for you no matter what your quilting requires. 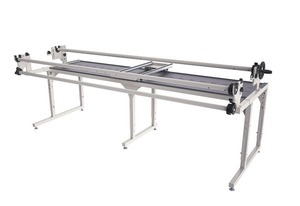 Think you might upgrade your machine to a longarm in the future? The Continuum frame can work with your short or midarm machine now, and then be adjusted for a longarm when you need it. 8 foot Queen Continuum Frame Maximum Quilt Area: Queen: 79" Crib: 31"